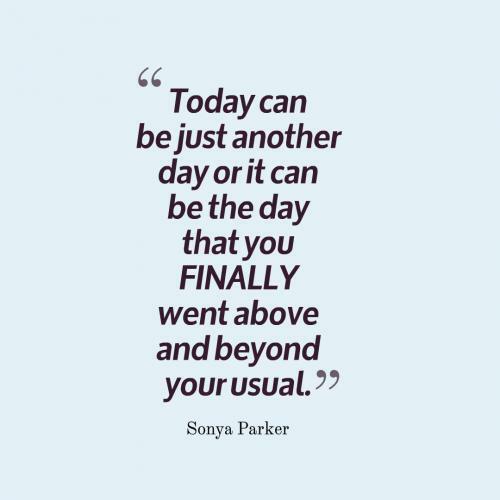 Today can be just another day or it can be the day that you FINALLY went above and beyond your usual. Each day is a new opportunity to live your life to the fullest. Don't let your TODAY be stolen by the unchangeable past or the indefinite future. 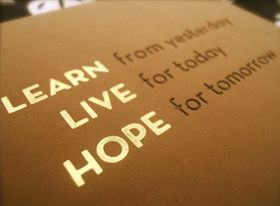 Take on today, this new day by force and do something you never did before; like live. Today was given to you for a reason, so rejoice and be happy. Never quit. If you stumble get back up. What happened yesterday no longer matters. Today's another day so get back on track and move closer to your dreams and goals. You can do it! What happened yesterday, no longer matters. Today is another day. Get back on the right track and move closer to your dreams. Yes you can do it. Be happy today. Achieve something today. Don't regret today. Make today a day to look back and smile. Life has no rewinds, and no forwards, it unfolds at its own pace so never miss a chance to LIVE today, and make a BEAUTIFUL story for tomorrow. The Future belongs to those who Invest in Today and have a Hope for Tomorrow. Whatever you want to do, do it because there is only so many tomorrows that AWAIT! Today means the present day. It is often emphasized that we should make the most of today and live in the present. You might be having a mediocre beginning to your life, but it is only today i.e. the present day that matters. All the hard work or efforts that you put in now or in the present time can make your future brighter and all the more meaningful. Winston Churchill had once remarked, “For good or for ill, air mastery is today the supreme expression of military power and fleets and armies, however vital and important, and must accept a subordinate rank.” There are several magazines based on national and international current affairs such as the “world today”. The world today is also a radio news program aired on Australian television.